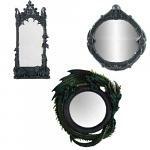 Buy a divination mirror or scrying glass to see visions of your past, present, and future. Divination mirrors will strengthen your psychic abilities and draw greater power to your Third Eye. Dream Mirrors are the perfect tools for those who cannot remember their dreams but know there was something important they didn't want to forget. You need to keep the Dream Mirror near your bed when you sleep so the mirror can absorb the energy and imagery from your dreams. The mirror is enchanted with a complex blend of spells which absorbs your dreams and reflects them back to you upon command. 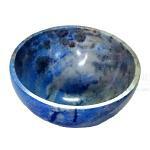 This hand-carved gemstone bowl features a rare and beautiful enchantment of Grecian origin. The binding is a powerful & revealing tool of supernatural power. The bowl provides psychic abilities, divine messages & thoughts, the power to exercise and utilize the powers of Oracles of ancient Europe, and the ability to summon those of great power to give you advice and guidance. You will receive a beautiful pillowcase imbued with spells to encourage intense experiences during sleep cycle: hyper-lucid dreaming, astral time travel, past life recreation, visions of & from spirits, Immortals, and ancestors, surreal adventure dreams, and visions of yourself in different life paths. It is a really amazing combination of spells that makes your sleep time something to REALLY look forward to every night! We were originally going to make pillows, but this way you can use this pillowcase on any pillows, or you can choose to lay it flat under the mattress or under your current pillow; having the case instead of a pillow opens you to possibilities, and you can wash as needed.